Number 5: Stanton Park. Stanton Park is located in the Near Northeast part of town, at the intersection of Maryland Avenue and Massachusetts Avenue NE. It was another original L’Enfant creation and was originally called Reservation 5. The park was named after Lincoln’s Secretary of War, Edward Stanton, after the Civil War (though interestingly, the statue in the center is not Stanton but Nathanael Greene, a Revolutionary War hero). The park is surrounded by the northeast Capitol Hill neighborhood, and gets visitors throughout the day. This park has a playground, so it’s a great community resource for Capitol Hill families with children. There’s also plenty of open space in the park for running around or playing games. On weekend afternoons, the park is full of people on benches, children playing, and neighbors just passing through. Square stats: four acres, a playground, lots of benches, and a statue that most people think is some guy named Stanton. Number 4: Logan Circle. Here’s a park that probably would have been on the Too Sketchy to Hang Out In List a decade ago. Logan Circle was another one of L’Enfant’s planned squares at the intersection of Rhode Island Avenue and Vermont Avenue NW, and it was converted to Iowa Circle in 1818. In 1930, the circle was renamed to honor John A. Logan, a Civil War general and Senator. That’s a statue of Logan in the center of the park. 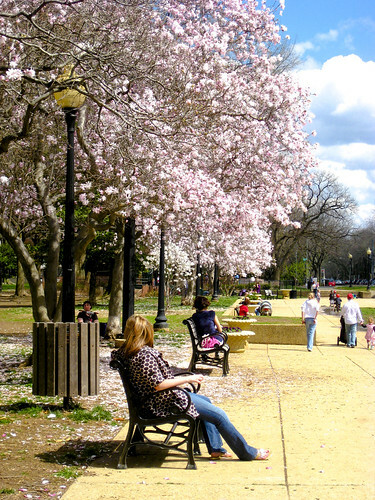 This park is surrounded by beautiful Victorian rowhouses and the Logan Circle neighborhood, and it’s a block away from the commercial corridor of P Street NW. The park attracts nearby residents and their dogs (seriously, the picture above is so spot-on– there are usually more dogs than people in the park), along with people-watchers on weekends. It’s a beautiful park, and it’s not as tourist-filled as nearby Dupont Circle, so it still feels like a neighborhood hangout. Circle stats: 2.5 acres, lots of benches, dogs’ paradise. Number 3: Kalorama Park. Up in Northwest, Kalorama Park lies in a little triangle of land where Columbia Road, Kalorama Road, and 19th Street NW intersect. This park wasn’t part of L’Enfant’s original plan, and it’s actually quite a young park– DC only got its hands on this parcel in 1971. But today, there’s a non-profit organization dedicated to protecting the park, and it’s got just about everything you’d want in a neighborhood park. There are basketball courts, a playground, a community garden, and a recreation center, all within a small triangle. 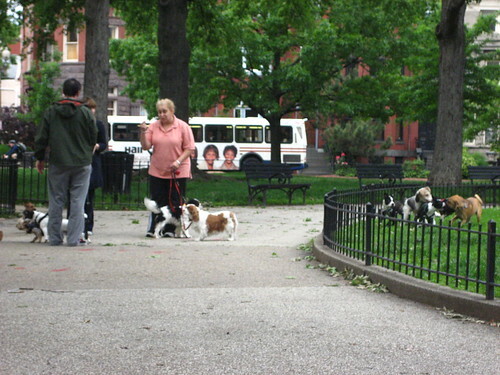 The park attracts a lot of residents from nearby Adams Morgan neighborhood, and it’s popular with families, teens, and dog-walkers throughout the week. It’s a great spot to relax in the middle of the city, and it has space to throw a football or frisbee too. Triangle stats: 3 acres, a playground, a rec center, a community garden, space to play in, and lots of benches. Number 2: Dupont Circle. 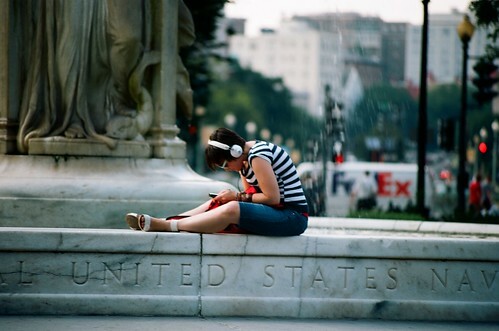 Dupont Circle is one of the great urban spaces in the District. It was another L’Enfant creation (and originally called Pacific Circle), though it remained undeveloped until after the Civil War. In 1871, the circle was constructed, and in 1882 it was renamed to honor Civil War hero Samuel Francis Du Pont. Dupont Circle is immediately surrounded by a major commercial corridor with retail and offices, with beautiful residential streets just off the circle. The circle has a Metro station (which happens to be the Five Favorites #1 Metro Station), it’s in the middle of everything, and the park is always full of people. People playing chess in the park, a jazz band playing by the Metro station, groups of friends and couples hanging out on benches, dogs and kids running around and playing in the fountain– it’s really an ideal public space. But it is edged out of the number one spot because it’s not exactly a neighborhood place (it’s probably filled with just as many out-of-towners as nearby residents on weekends), and there’s just not much to do here besides sit and people-watch. Circle stats: 2.5 acres, lots of benches, a great fountain, near-constant games of chess going on. Number 1: Lincoln Park. Back over in Capitol Hill, we find yet another park that was on L’Enfant’s original plan. Lincoln Park actually used to be a dump, then the Lincoln Hospital during the Civil War, then finally a public park in 1867. The park includes a controversial statue of Abraham Lincoln called the Emancipation Memorial that was a major tourist attraction in the late 19th century, as well as a statue of activist Mary McLeod Bethune (see Tom’s take on these two statues in Monumental). Lincoln Park is surrounded by residential uses, and neighbors can be found in the park throughout the day. 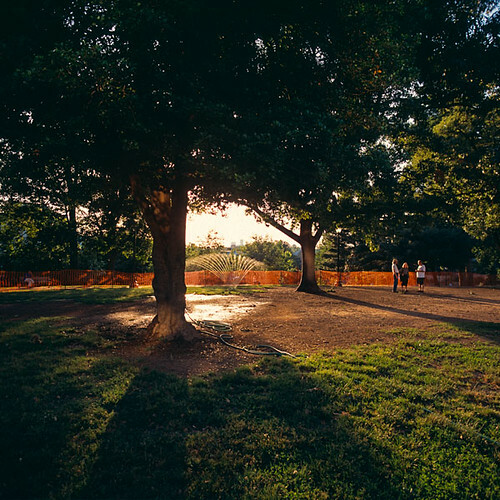 The park is full of picnickers, families with kids, frisbee throwers, dog walkers, joggers, and people watchers on weekends, and it’s a great cross-section of the nearby neighborhoods. Lincoln Park is everything that an urban park should be: it provides space for nearby residents, and it has some functional space (playground, paths) but it is mostly just a great space to hang out in. There are plenty of trees, beautiful homes nearby, and it’s a great place for people-watching. Square stats: 7.5 acres, a playground, lots of benches, and lots of open space. So there you have it: the top five neighborhood parks in the city. It’s amazing the range of parks that exist in the District– just three blocks away from #4 Logan Circle and #2 Dupont Circle stands Scott Circle, a completely dead auto-dominated park that doesn’t even have pedestrian access. And many of the parks on K Street (Franklin, McPherson, Farragut) only attract homeless people and lunchtime office workers because of the nearby land uses. So what elements does a park need to be great, like these five? Seems like the winning formula is lots of trees, lots of benches, residential communities nearby, and easy pedestrian access. I tried to pick neighborhood parks, rather than federal ones– even though technically they’re all National Park Service property. And I’ll second your vote on an Arlington Rhombus, I’d love to see that happen.